We are all very different but also have the same taste in a lot of things, including food. There are so many epic restaurants in New York, but we knew from past sister trips that it wasn’t fun to have to rush to a reservation when we were having a good time at the other end of town. So after our legs got tired, we would just look around or look on google maps to see what was close by, and every time, for every meal something perfect would pop up. I had mentally prepared myself for lots of Italian food, pizza, quirky diners and delis (all of which I was totally in to), but what we actually found is that the healthy, plant-based food scene in New York is OUT OF CONTROL! Which was a good thing because between the busy sidewalks, the sights we wanted to see and the two of my sisters who were not shopping in sad Canadian dollars, our days were actual 15 hour-long full body workouts and we needed our strength. By Chloe –our first dinner. Entirely plant-based, and sort of like a charming, healthy fast food restaurant. I had an epic kale Caesar salad and mac n’ cheese (dude, I’m pregnant). Beyond Sushi –Unique, veggie-packed sushi in Chelsea Market. We each got different rolls and one sister got a salad roll. They were all delicious and I feel like someone should open this in Vancouver. Hai Street Kitchen – We found this as part of a street food setup in mid-town and despite all of the tempting choices, we all chose the same stall. They serve amazing ‘Sushi Burritos’ loaded with veggies, including a deeply satisfying vegan option. I have to try this at home. Le Botaniste – This popped up out of nowhere when we really needed a place to sit down and eat after a one store destination treck to the upper east side. Totally organic, plant-based big bowls of warm or raw vegetable-y good times. They also serve organic, sulphite-free wine. The last place was a really good, spontaneously found modern Thai restaurant, somewhere close to NYU that I never got the name of. We literally walked in off the street because we were hungry and our feet were going to fall off. It had some unique menu items and lots of fun Thai veg dishes that were outside the norm, including this amazing cabbage. It doesn’t sound exciting but it was by far the favourite (we should have gotten two) and it has stuck in my brain all week. That says a lot for cabbage. The version we had was a little more oily, was probably seasoned with fish sauce, and had lots of chili and garlic. Our version also has lots of chili and garlic (because it makes the cabbage dance and is also great for our immune system) and includes ginger (because I came home to chilly rainstorms and could use a warm rhizome hug) and tamari in place of the fish sauce (although, you could easily just season it with a little bit of sea(weed) salt instead). I also threw in some cilantro at the end because I love it but also because after all of that airplane time, a little bit of help removing radiation from the cells comes in handy (obviously very relevant if you’re going through radiation treatment too). 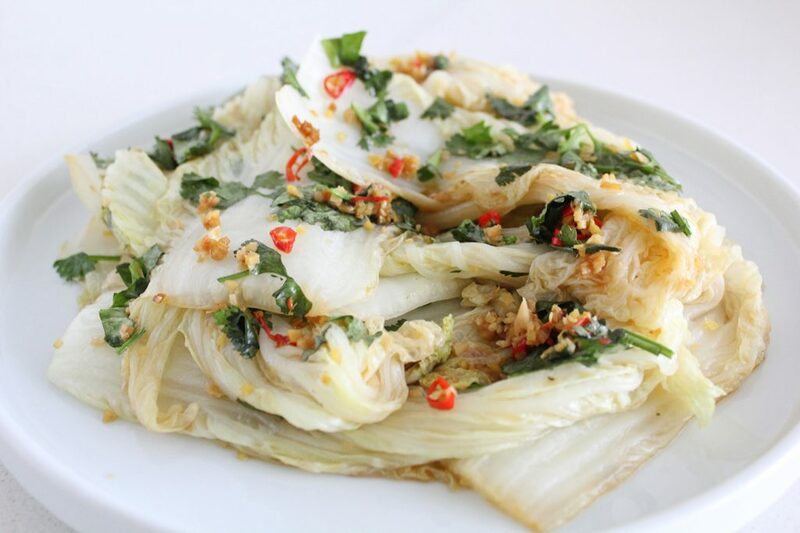 The beauty of the cabbage dish is in its simplicity. 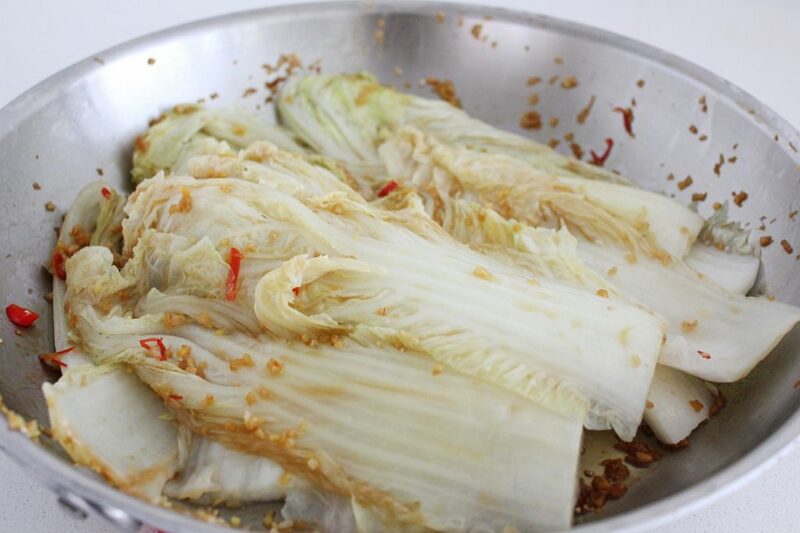 I used Napa cabbage because the texture is really nice when you leave the leaves whole (and that’s what they did at the restaurant), but it would also be nice with savoy or regular green or red cabbage (maybe just chop or tear the leaves up a little more). 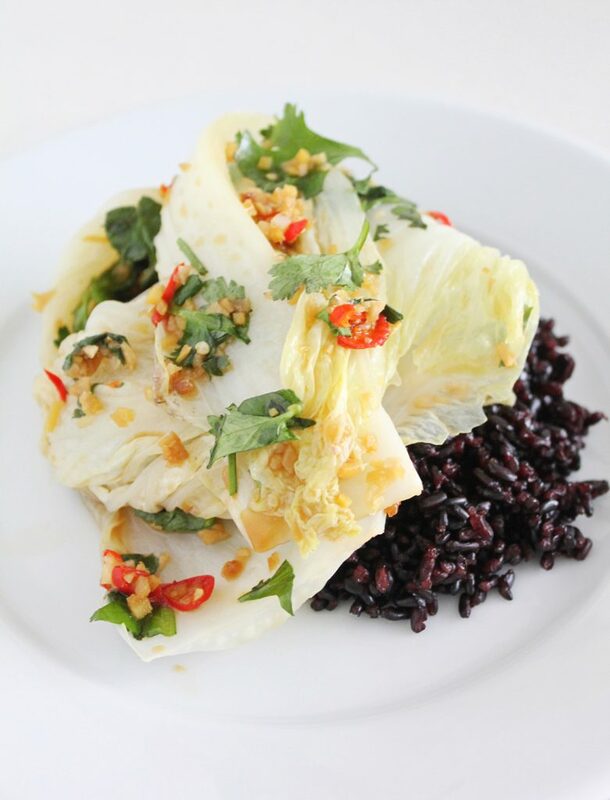 Serve spread out on a platter, for a more interesting, warming salad replacement or serve it with some quinoa or rice. 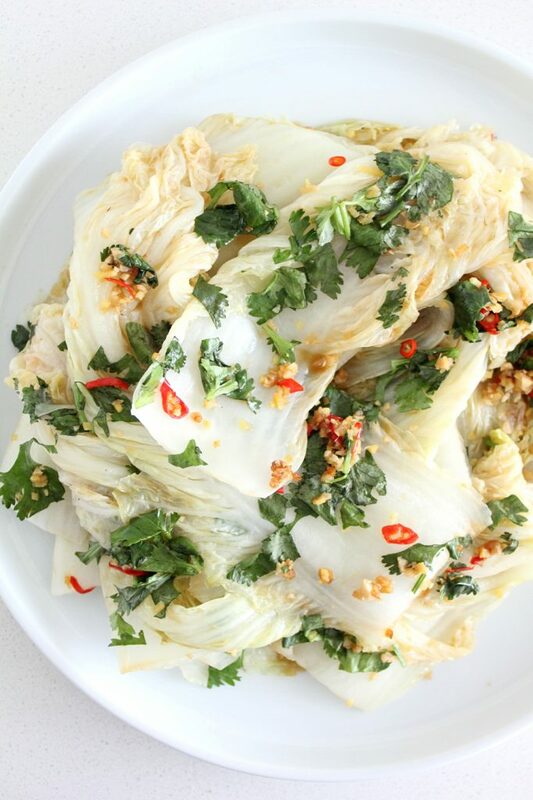 I really didn’t think I would come back from New York City with a cabbage recipe for you, it just happened that it was one of the best things we ate. There will be more fresh colourful recipes to come, I think I just need a little more sun and maybe some happy, tired feet to conjure up the inspiration. 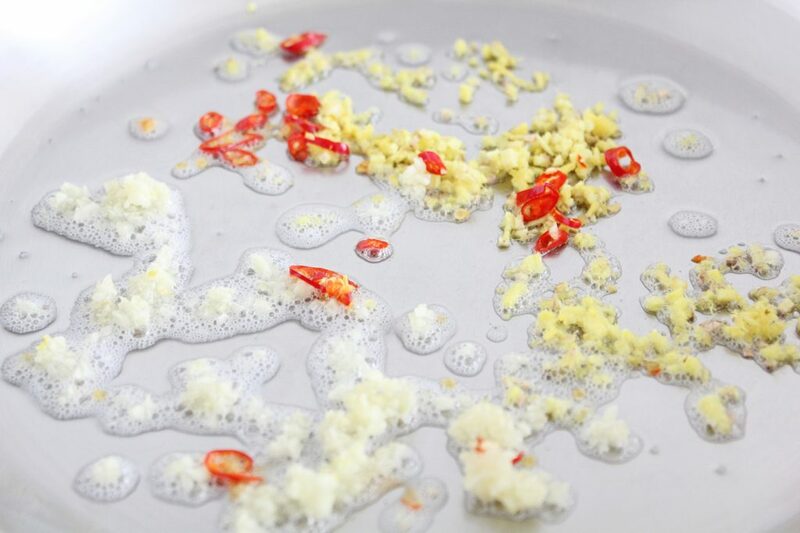 In a large frying pan or wide-bottomed pot on low heat, gently sauté the garlic, ginger and chilies in the coconut oil until fragrant. 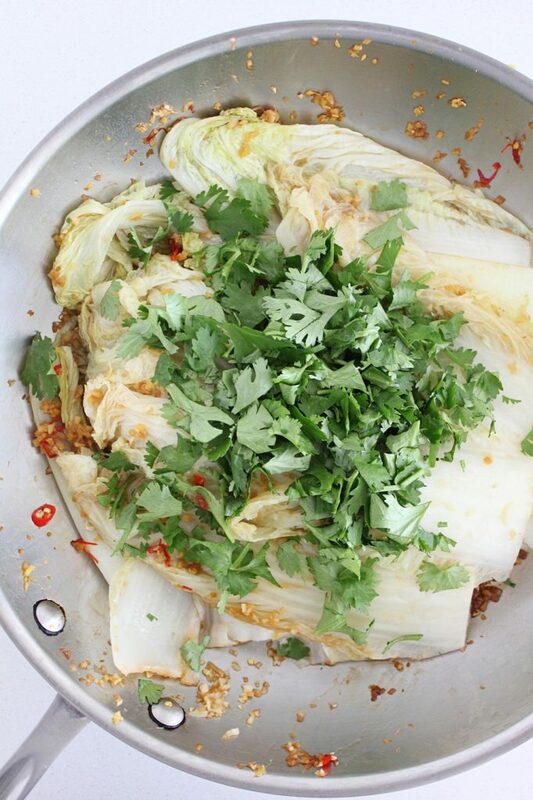 Add the cabbage leaves, tamari and water raise the heat to medium and cover with a lid (or a baking sheet -anything that fits on top). 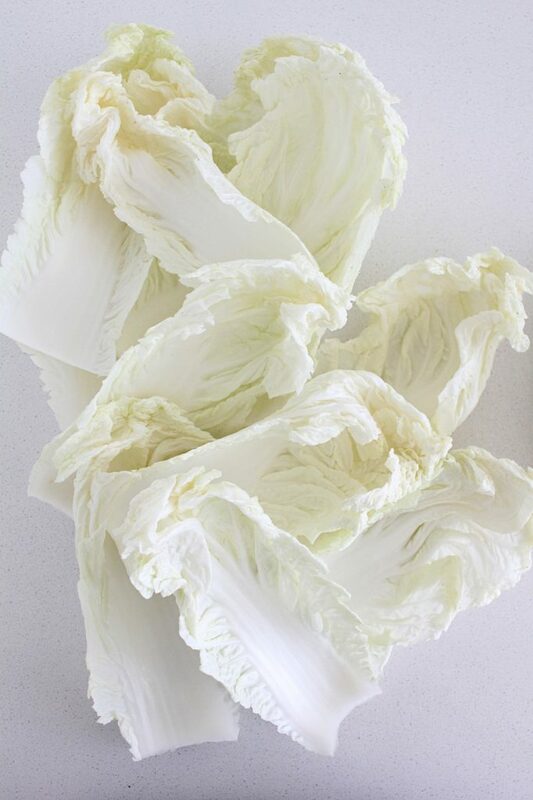 Squish the cabbage leaves down with the lid if you need to, they will shrink considerably. 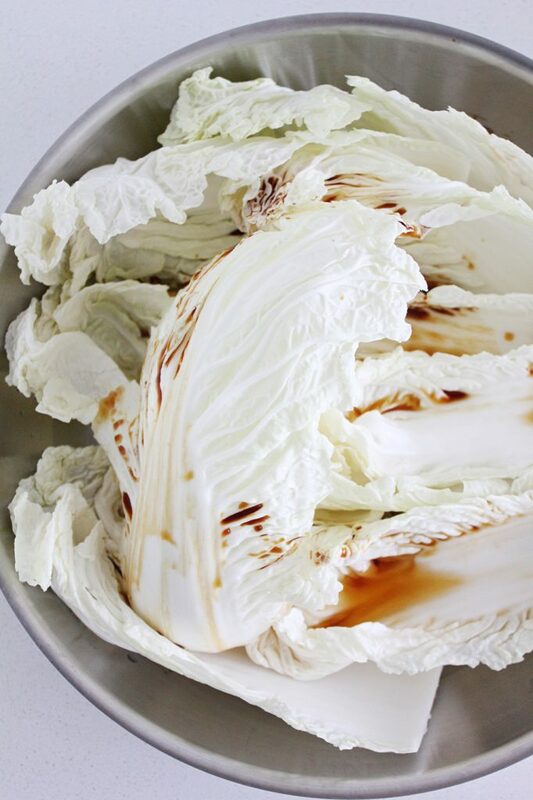 After a few minutes, take the lid off and gently move the leaves around with tongs or a wooden spoon (put the bottom ones on top, just make sure they are cooking evenly). Put the lid back on top and continue to steam until they are softened but not totally dead (5-7 minutes). 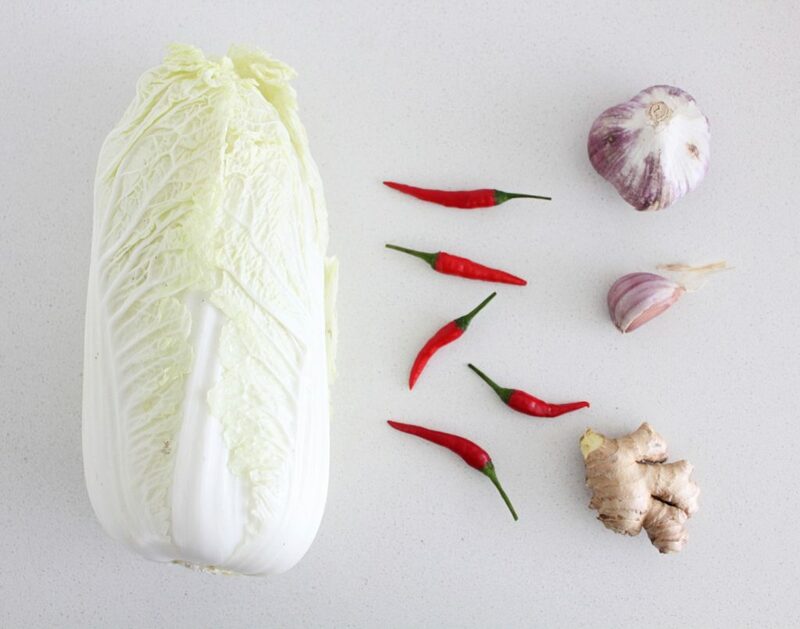 If the cabbage is cooked before the water has evaporated, take the lid off and turn up the heat to boil away the excess water. 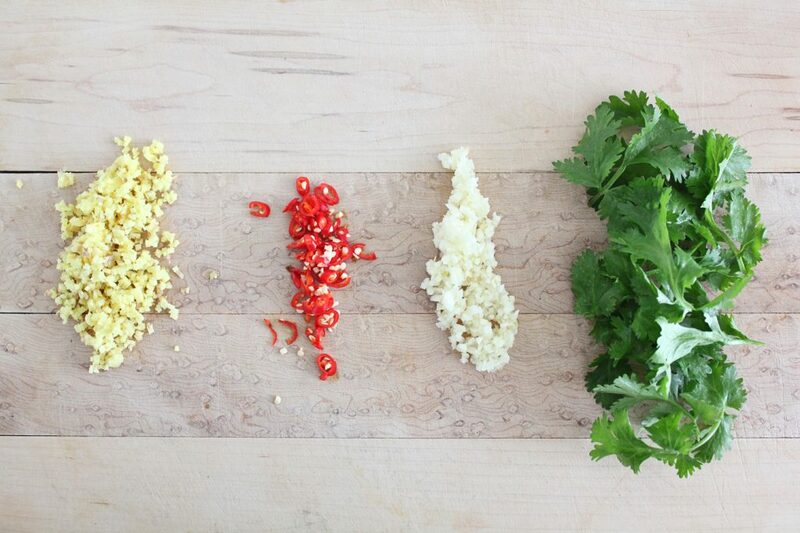 Turn off the heat and add the cilantro. Give one final stir and serve.